Wheelchair Accessible, Very Spacious, 10mins Beach & 3min walk Pubs/Restaurants! The price quoted is for the Complete Villa, both upper and lower levels. Villa in tip-top condition inside & out, with high-speed WiFi and Air-Conditioning in nearly all the rooms. The villa is large detached 4-bed Villa (sleeps 14) on two levels with two separate entrances (1 ramped & 1 stairs), and comes with a private 9x5m kidney-shaped swimming pool. 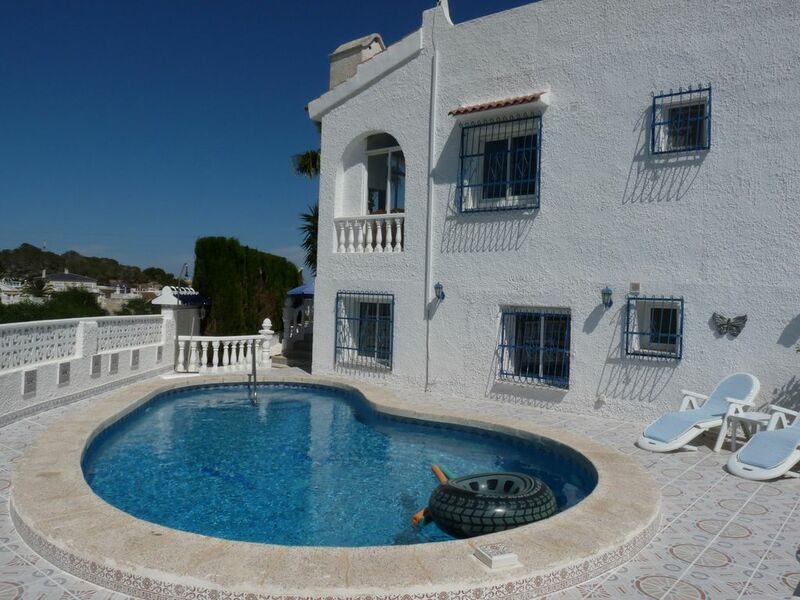 - Lower level 2-bed Villa Apartment (sleeps 7 to 9) - Wheelchair accessible! ... So, the Villa can suit all budgets! Contact me for a quotation now!! Property PERFECT for 2 families holidaying together, large families or groups!!! Villa comes with all home comforts and includes air-conditioning (both upper & lower levels), WiFi Internet, SAT TVs (2 x 42' LED 3D flat-screen), sunny balcony with awning, massive roof solarium, dishwashers, HiFi, BBQ, games room, darts & much more! Pubs, restaurants and shops within a 3 to 20 minute walk from the Villa (inc. the Villamartin plaza! ), though I always still advise a car for shopping and exploring. Located on a large corner plot in a quiet residential area in cul-de-sac with little to no passing traffic, and facing open-land so great poolside views and not overlooked. Around a 20min walk away you'll find the ever popular Villamartin plaza with a wide selection of restaurants, golf course and activities to entertain the kids (nightclub, arcade, shops, etc). Just a short 10min drive away (3 miles/5 Km) will take you to many glorious Costa Blanca sandy 'blue flag' beaches, La Zenia & Campoamor to name but two of MANY. Choice of airports; Murcia/25min drive or Alicante/45min drive (Valencia also possible). Local area: The Costa Blanca is one of the healthiest places to live in Southern Europe with 320 days of sunshine a year and a year round average temperature of 20 degrees. There are miles and miles of blue flag beaches within a short drive. Murcia city and Alicante are both within 40 minutes drive away and offer a multitude of museums, shops, cafés and restaurants. Just a bit further up the coast is the cosmopolitan resort of Benidorm with its theme parks and great night life. Closer still is Torrevieja a bustling seaside town ideal for paseo in the evening. As with restaurants and cafes, the Orihuela Costa is drenched with a broad.....nay..MASSIVE range of bars and pubs, from little Spanish 'holes-in-the-wall', to Australian & American Bar / Diners, traditional Irish, Scottish & traditional English pubs, with some German, Belgian, Dutch & many others thown in for good measure to gain you a nightlife experience that you will not forget. Golf: Villamartin Golf Course At a Glance Holes: 18-holes Distance: 6706 yd Par: 72 Green Fees: € 46.00 to € 61.00 Fees available at publishing Course Designer: John Putman Annual Closure: No Facilities: Pitching and putting greens Notes: Advanced booking recommended. Proof of handicap necessary. (28/36) Villamartin Golf Course was constructed and build by Mr. Putmann and opened in June 1972. Villamartin is situated on the southernmost tip of the Costa Blanca and (therefore) boasts one of the healthiest climates in Europe. For this reason, the area has become the centre of a thriving holiday industry based on family owned (property) properties. The area has many sandy beaches and there are a large selection of bars and restaurants offering many styles of cuisine. Villamartin hosted the 1994 Mediterranean Open which was won by Jose Maria Olazabal after an exciting play-off with Paul McGinley. Villamartin Golf Club has an exciting design and many challenges. The course is par 72 and the length is 6132 meters from the white tees, 6037 from yellow, and 5259 from red. (Hole 17 counts as a signature hole and is a par 3 with more than 200 m from the back tee. A deep ravine is collecting many balls, and an extremely undulated green will be a challenge to most players). Hole 17 is the Par 3 signature hole with a demanding 200m carry off the back tee onto an extremely undulating green. I'm from Scotland and bought this villa in 2002 from the proceeds from working for IBM for many years. Since then I have, however, diversified and now teach, perform & seek more creative ways in which to support myself. toilet, combination tub/shower, Upper Level Main Villa - with Aqua-jets! Many fantastic sandy & kid-safe beaches all within a 10 to 20min drive away. From the roof Solarium you can see the sea over the Villamartin golf course, but only just, as it's 5Km away. There is a large air-conditioning unit in both lounges, as in the upper & lower levels, plus air-con in 4 from the 5 sleeping rooms. There are also either a ceiling fan or side fan in all rooms. There is a built-in gas fire in the Main Villa lounge and 2 x portable gas fires. There are two washing machines, one located in the Main Villa kitchen and the other in Villa Apartment kitchen. There is a clothes line on the roof and another on the lower level at the back-stairs, along with a small dryer-stand. There is a built-in fake-log gas fire in the Main Villa and two portable gas fires available for use in the other rooms and the Villa Apartment. There is Wireless Internet available in the Villa and accessible from anywhere on the premises. 1 x hand and 1 x bath towel per person are supplied. Fast, secure & two signals, as in one for the upper-level and another for the lower-level. The Main Villa lounge has air-con (hot & cold) plus a gas fire with sofas. The lower level Villa Apartment also has sofas & portable fire. Both are large with space for extra chairs, as necessary. Dishwashers can be found in the Main Villa & Villa Apartment. There is a fridge in the main villa & another in the Villa apartment. There are two 'touch' hobs, one 4-ring in the Main Villa and the same in the Villa Apartment. There are two ovens, one in the Main Villa with built-in timer & the same in the Villa Apartment. There are two microwaves, one in the Main Villa and one in the Villa Apartment. Both the upper-level Main Villa & lower-level Villa Apartment have a coffee maker. There is a toaster in the Main Villa & Villa Apartment. Oil, sugar, pepper and so on is supplied. There are dishes and utensils for the many people staying in the complete Villa (Min 14 people! ), double in fact because of the dishwashers. There's a fully fitted kitchen with EVERYTHING you could possibly need both on the upper-level and another one on the lower-level. There are many areas at which to dine, as in an enclosed dining area with 20+ wooden/plastic chairs, sunny balcony with outside table+chairs, roof solarium, bbq area, etc. There are 2 x wall-mounted flat-screen 42' 3D LED TVs both with WiFi & connected to a DVD Player. There are two Android boxes supplied for accessing your favourite TV channels, Movies, Series and more! One is located in the Main Villa and other in the Villa Apartment. There is a portable getto-blaster for use at the poolside or on the large Solarium. There is a DVD Player in the Main Villa and another one in the Villa Apartment. The downstairs apartment has a games room and contains lots of fun things, such as a darts board, board games and more! In the separate games room you'll find a selection of board games, poker set, cards, dart board and more! Various, both for use in the pool and board games, etc. There is a palm-tree garden covered with stones and shaded by bordering plants. There's also a hammock perfect for relaxing in the shade. There is a sunny balcony accessible from the Main Villa which catches lots of sun in the morning and beautiful in the evenings too. There is a large enclosed terrace, which is perfect in both the Summer for shade & through-draft and in the Winter. The VillaMartin golf course is just a 25min walk away! There are many other great golf courses within a 30mins max max drive. The Lower Level Apartment is wheelchair friendly. The main entrance has a ramp into the property & into the apartment. All the doors are over-sized and the bathroom has hand-rails, disabled toilet, tap & seat in the shower, with wide entrances. The kitchen also has a sink with disabled tap. The private swimming pool is 9x5m and has metal steps at the 2m deep end, and steps with hand-rail leading into the 1m deep shallow end. Lovely clean villa, very quiet area. Great villa. Everything provided for an enjoyable stay. Very clean and well maintained. Lovely villa with a great pool to escape the heat. There are great BBQ facilities and shops and restaurants near by. We had a good time away and a much needed break. The property management were good and helpful with directions to the beach and other amenities. With facilities like aircon and wi-fi it really added to the experience. we really enjoyed our stay in case paolo. good location with nearby local amenities. the kitchen is large and we'll equipped...the Appartement offers the possibility to eat on a lovely terrace, one is under a roof, the other outside. you can also enjoy the sun on a beautiful, open roof terrace. we can only recommend a stay at this house!!! All you could want for a great holiday will go again i hope . Pool well kept all mod cons. I was with my wife last easter and really we spent some fantastic days. Weather didnt invite us to use the big swiming pool available but we had some quiet and relaxed days. Villa has all facilities you could need and it was comfortable and warm. Villa is situated in a peaceful area, at least in that days and you have some bars and restaurants ( british mainly) in a short distance walking although, we, as spanish people , prefered go to other near places that you can find without problems at 5-10 minutes by car. Besides all paperwork for renting the Villa was very clear and fast. It has my positive recomendation. Near La Zenia beach and many other beautiful Costa Blanca and Costa Calida beaches, most within a 10 min drive. The Spanish town of Torrevieja is just a 15 min drive away, along with the typical Spanish town of Oriheula. There are also some aqua parks in the area, along with go-karting, cinemas, many markets and much more. Golf: Within walking distance of the Villamartin Golf course and many other to select from within a 10 to 30min drive. For the price stated you have EXCLUSIVE USE of the Villa with private 9x5m pool. The price quoted is fully-inclusive using the COMPLETE Villa, as in both upper & lower levels.. Prices stated are based on UP TO 8 PEOPLE and then there's a "per person" per night additional charge. The change-over day can be ANY DAY in ANY SEASON, except PEAK SEASON which is Saturday (July & August)!, but enquire if unsure and I'll let you know. There is a fully refundable SECURITY DEPOSIT required with full payment of 500 Pounds / 600 Euros when renting the "Complete 4-bed Villa", or 250 Pounds / 300 Euros if only the upper or lower level is rented, payable directly to the owner. If you require usage of ONLY half of the VIlla, as in the upper-level (2-bed / Sleeps 5) or lower-level (2-bed / Sleeps 7) then a reduction of 10% will be made from the price, enquire and I'll send you a quotation. You will still have exclusive use of the Villa, as in the other level will NOT be rented out to any other parties during your stay. If anything is unclear then feel free to send me an email and ask!